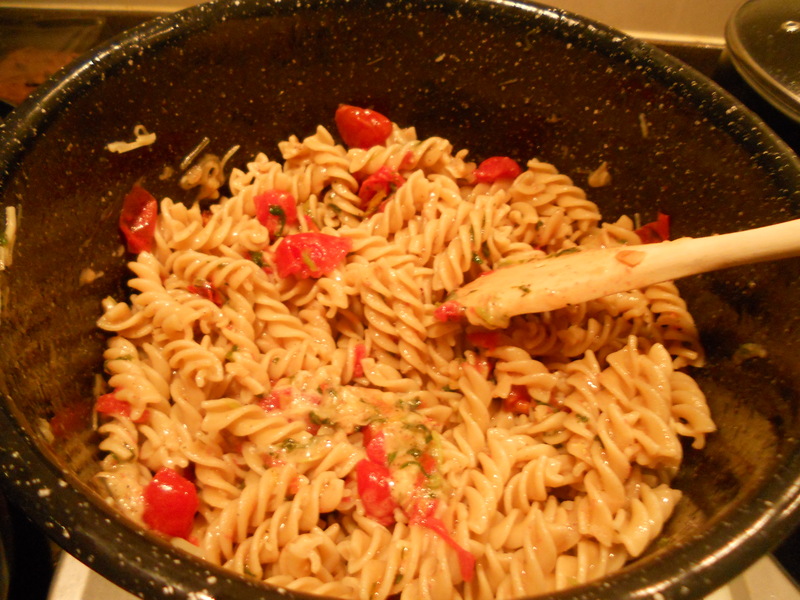 Pasta is without a doubt the most commonly cooked item in a college kitchen. It’s easy, quick, cheap and tasty. That being said, it can also be extremely boring; and that is precisely why God created cheese. 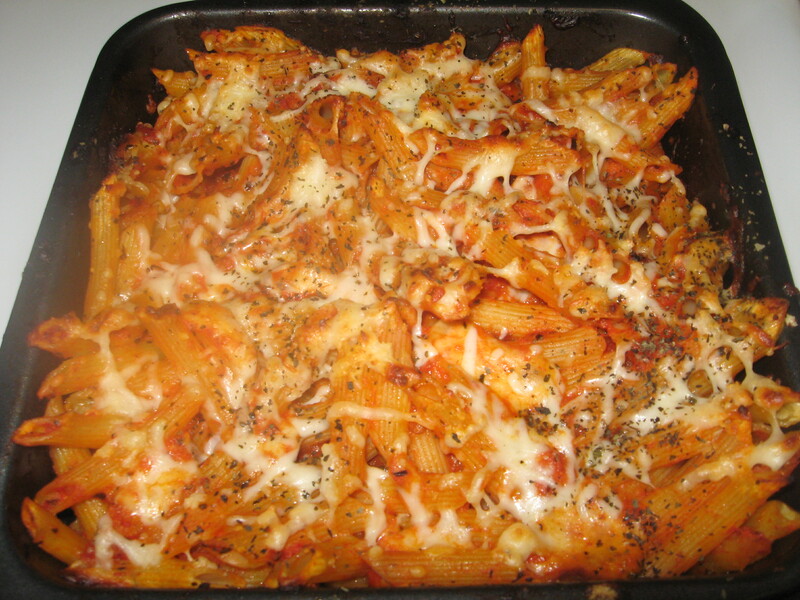 Funny how you can throw sauce and cheese over pasta and it magically transforms into a completely different dish. My cheese of choice? Definitely mozzarella (as if you faithful readers didn’t know that already). 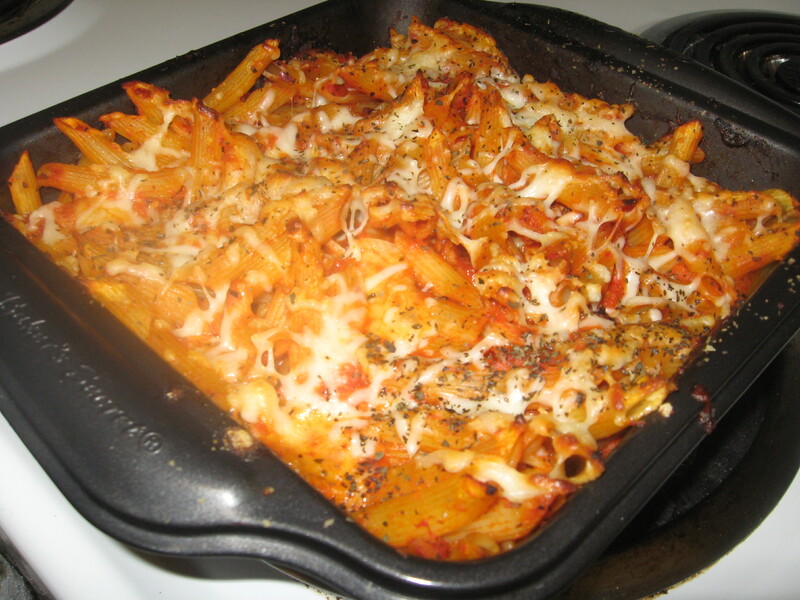 Baked ziti is the perfect solution to turn that plain old box of pasta into a classic favorite. 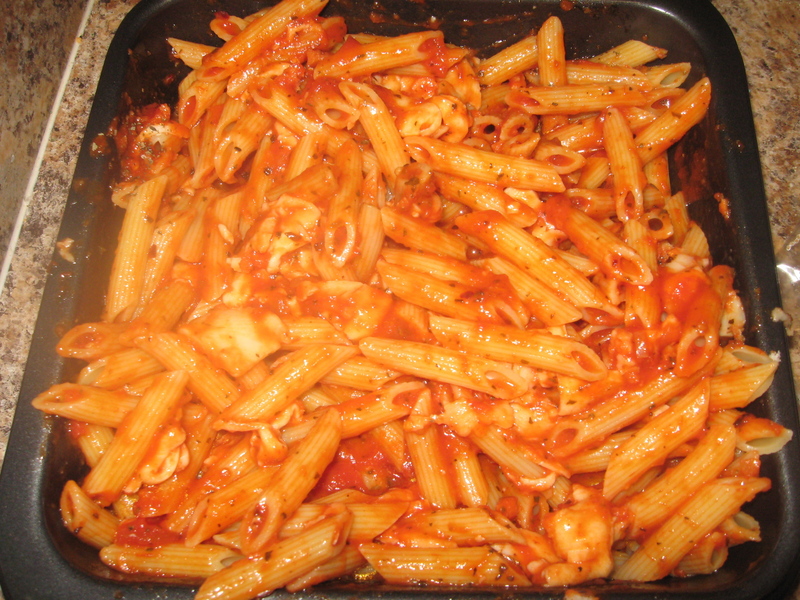 Now I know it’s not the healthiest of meals, and it does take a good chunk of time for the pasta to bake. But in my defense, it’s super easy and you only need a few cheap ingredients… so hey, two out of four objectives isn’t too bad every now and then right? Trust me, the taste makes up for it. 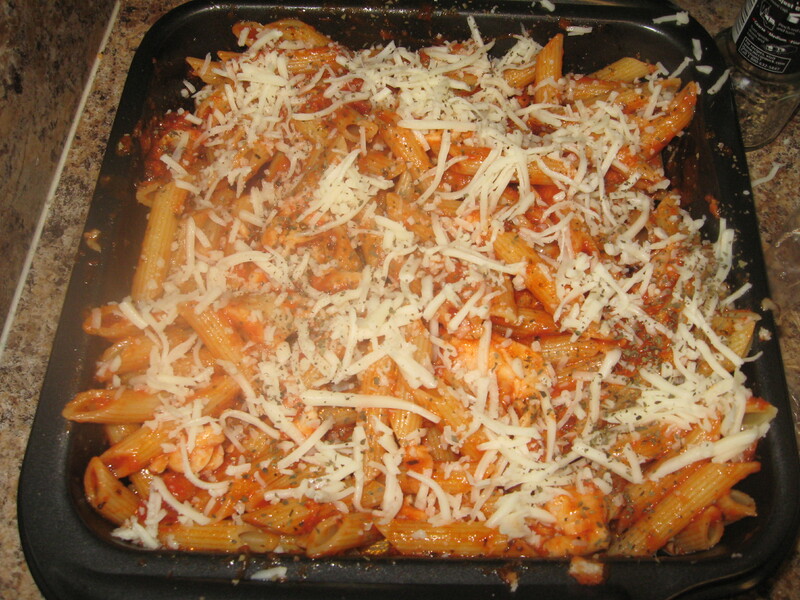 One box of pasta:we used penne, which is really similar to ziti. About half a jar of your favorite sauce, or if you have a lot of spare time on your hands (yeah, right), make your own sauce. For a great sauce, try any Newman’s Own. 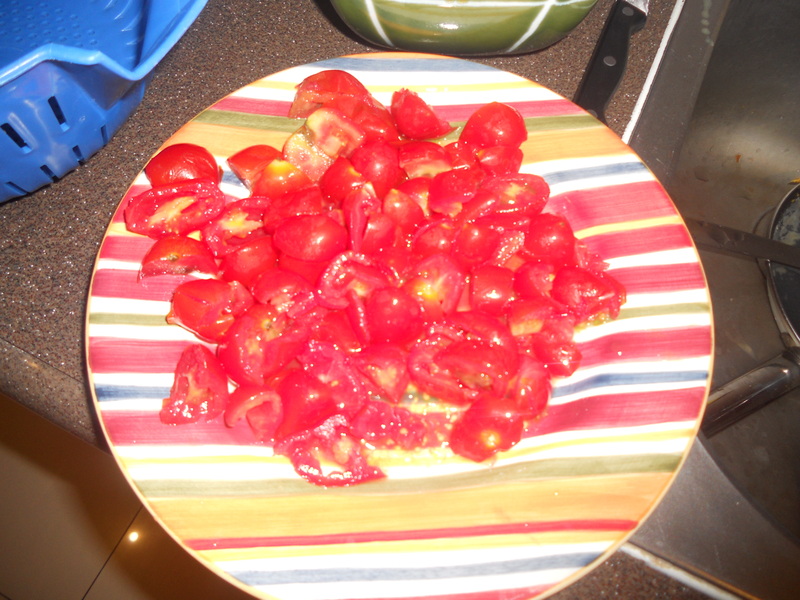 We used Fire Roasted Tomato and Garlic. – your oven to 350 degrees. 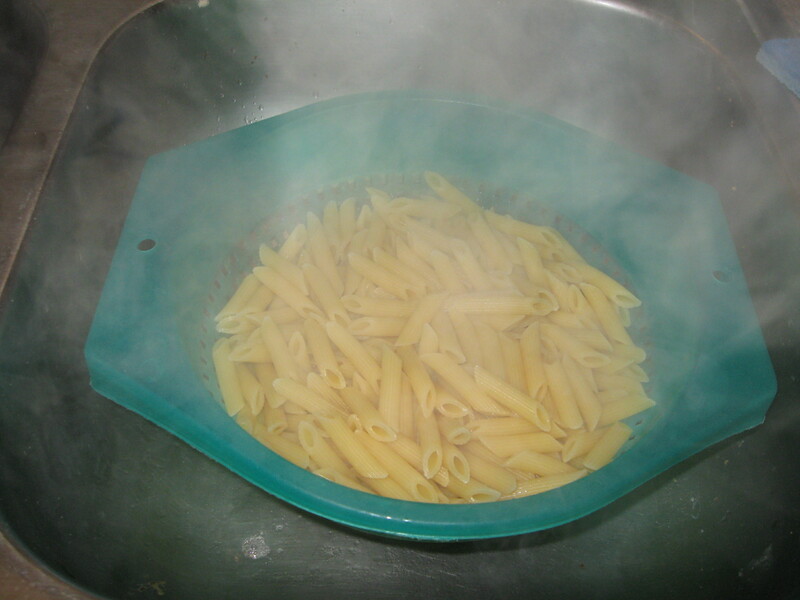 Cook the pasta regularly, until it’s al dente (a little bit firmer). 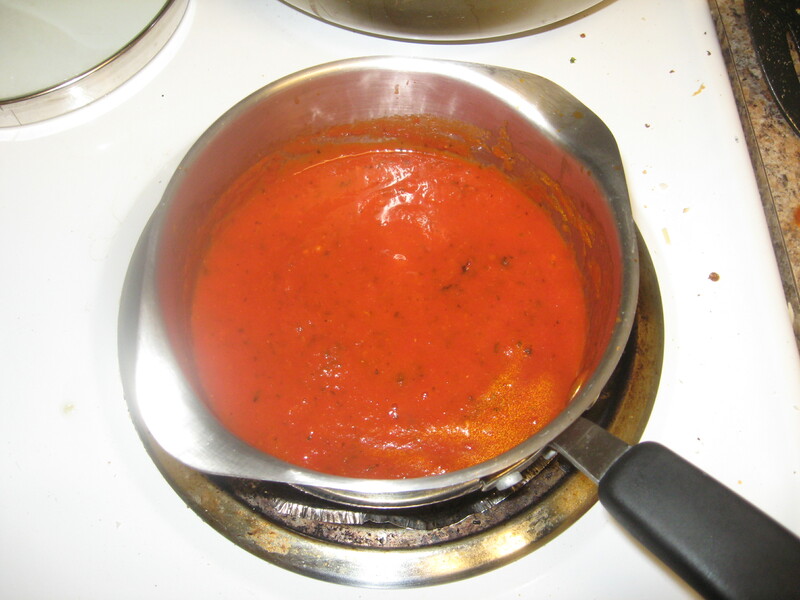 Heat your sauce on medium heat while you cook the pasta. Don’t let it burn! If it starts bubbling, take it off the heat. While the pasta’s cooking, slice or shred the mozzarella. 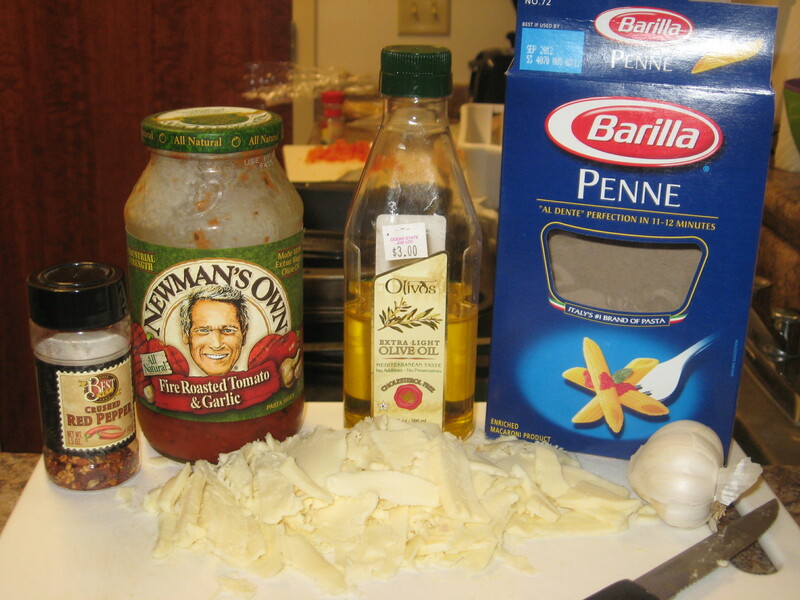 We used thin slices throughout the dish and then topped it with shredded mozzarella (see picture). 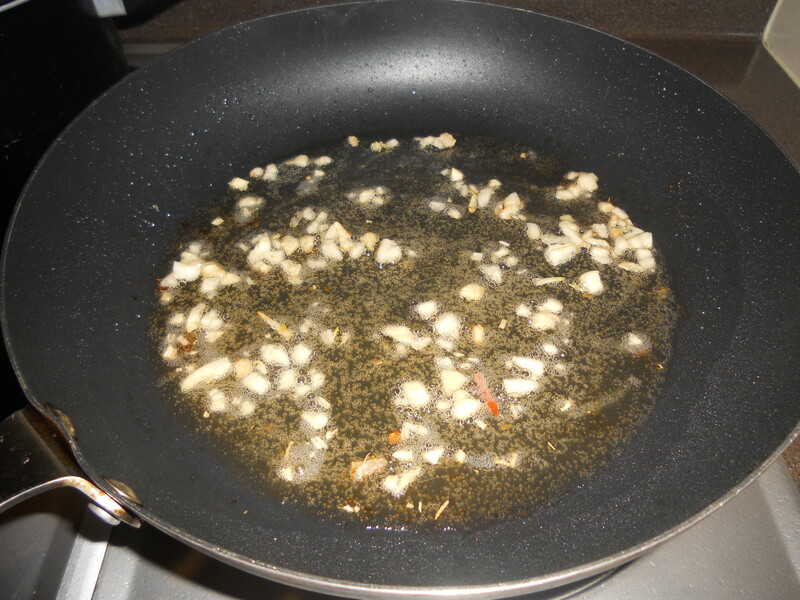 Once the pasta is done, drain it and drizzle a little bit of olive oil, then stir it carefully. 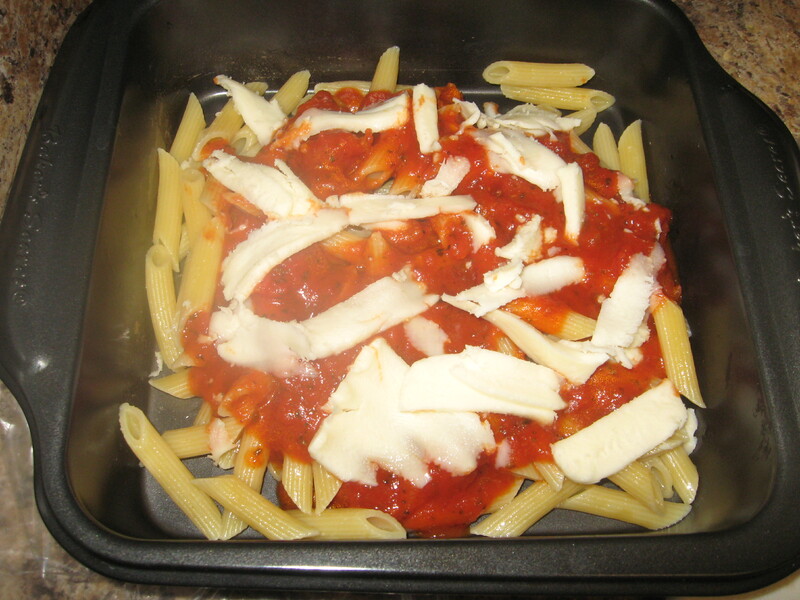 In a square dish (or larger if you’re cooking for more people), add the pasta, then a thick layer of sauce, and half of the mozzarella cheese slices (see picture). Repeat step 5 on top of the first layer, so you have two identical layers. 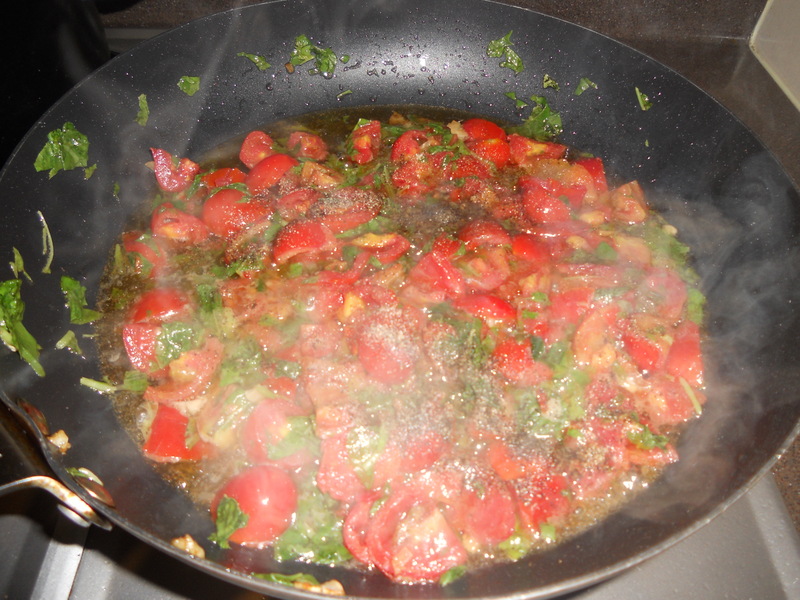 Then sprinkle the basil, garlic powder and black pepper over everything. Stir it all together, making sure you reach the corners and the mozzarella and spices are distributed evenly throughout the dish. Next top it all off with shredded mozzarella (using a grater or cutting up the mozzarella thinly), spreading the cheese evenly over the top. Stick it in the oven at 350 for 30 minutes, and it should be golden brown on top with the cheese melted. And there you have it: a boring old pasta dish turned gourmet. And it wasn’t even difficult! Buon appetito! Great news for the pesto lovers out there: it’s good for you! 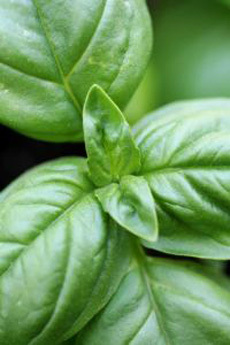 According to FinQooArticles.com, it’s good for digestion, the immune system, gout, muscle pains, rheumatism, and the respiratory system, plus basil has been proven to be a cancer preventative herb and aid with diabetes. That being said, it’s also absolutely scrumptious on pasta, pizza, bread, or as a marinade. Pesto is pretty easy to make, and once it’s done all you have to do it add it to your meal: paired with pasta and chicken is my favorite. 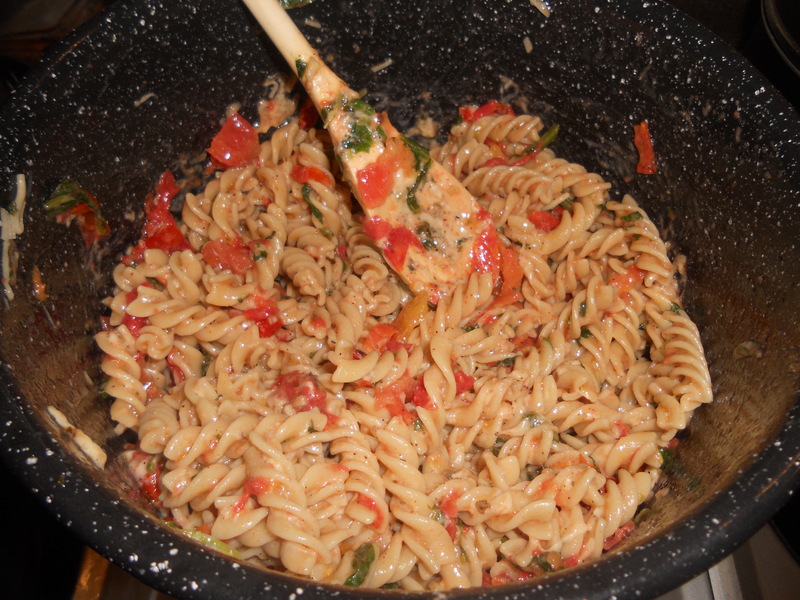 For those of you who are running from class to the library and only have time to boil some pasta and add pesto sauce, there are some great mixes out there that you just have add olive oil to, like Sweet Basil Pesto Mix by Simply Organic, or Tastefully Simple’s Dried Tomato and Garlic Pesto Mix. You can look for these packaged dried mixed at your grocery store, usually in the pasta or sauce section. Place everything (seriously, everything listed above) in the blender and pulse a few times then process until the mixture if fairly smooth. 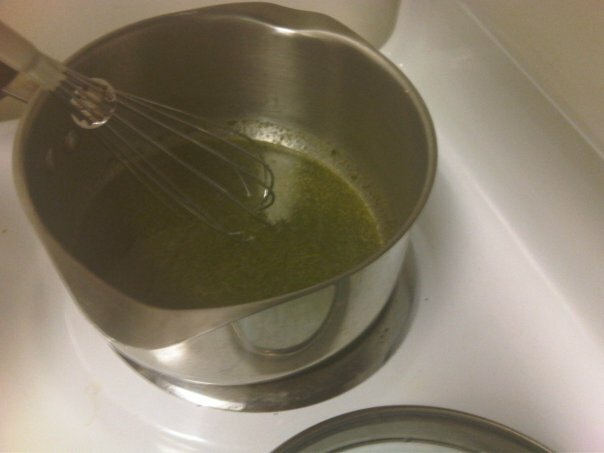 Some people like pesto at room temperature or cold, but I prefer it a little warm, so I put it in a pan over medium heat for a few minutes and stir with a whisk before serving. And that’s all, folks. I told you it was a simple recipe! 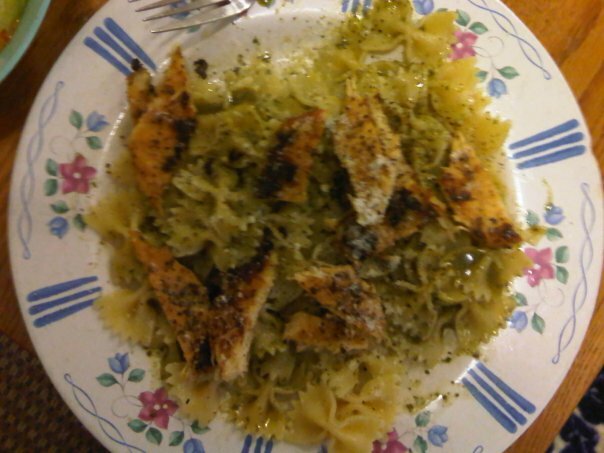 Like I said, my roommates and I usually enjoy pesto with pasta and chicken. 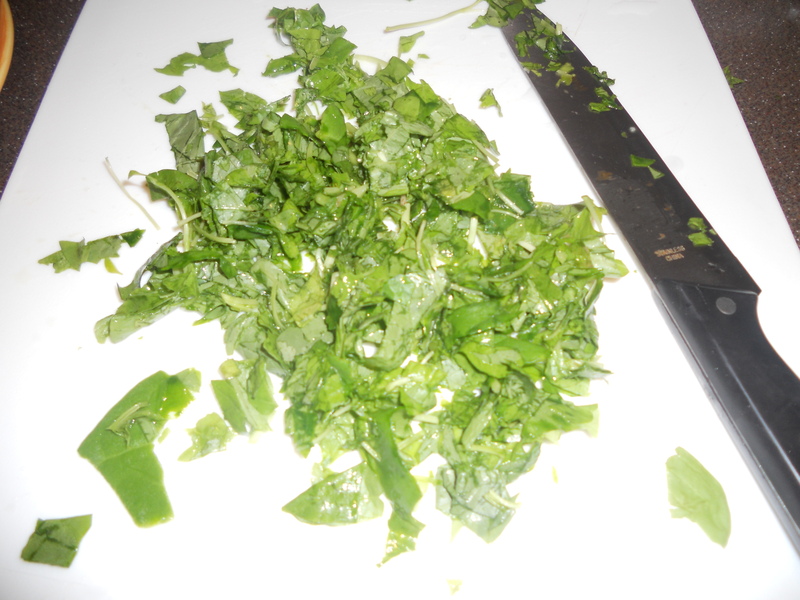 But for the healthier option, use it as a sauce over grilled chicken breast and serve with vegeatbles or salad.